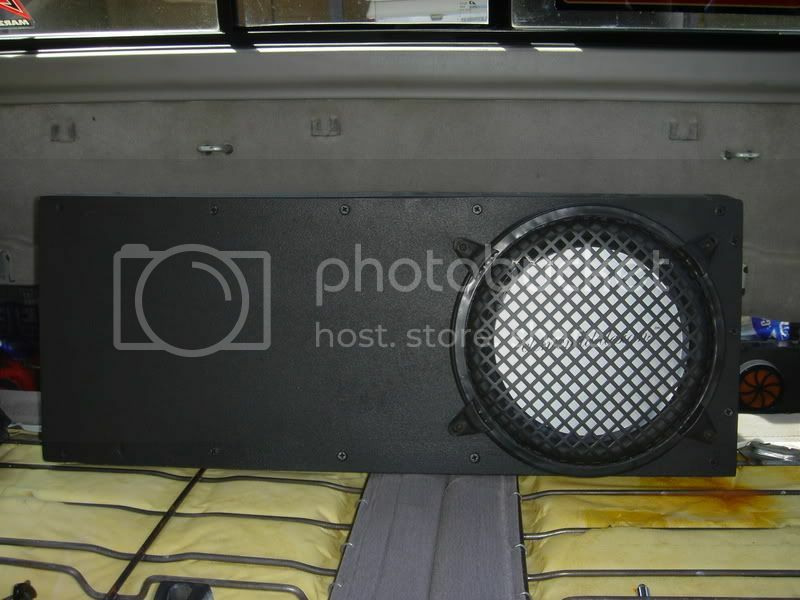 Does anyone know of a custom fit subwoofer enclosure that will fit behind my 2004 Tacoma Doublecab back seat? I currently have a custom built enclosure that houses three 6" subs, but I want to go to 8 inch, or even 10 inch if possible (I know this is asking a lot). With some modifications I made I am putting the final touches on 2 10" behind the seat. Yamataco provided me with some very helpful ideas! Red 04 Tacoma TRD SR5 4dr. 4wd. 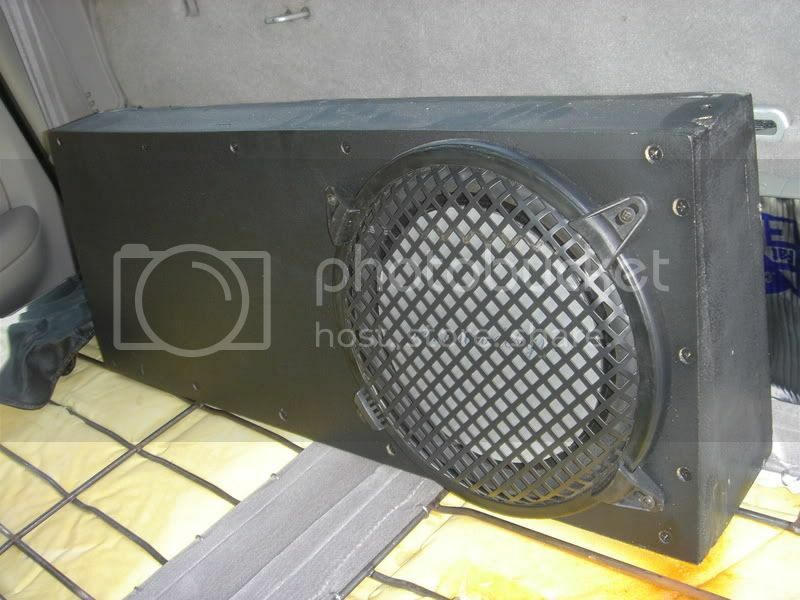 Here is a 10" sub that has a minimum mounting depth. I am running two of their 8" subs in my car and am very happy. The only dimensions I would use for a box is how far out it could go. Then, degisn your airspace accoring to your specific sub by making it wider or narrower. Do you live in NorCal? Have you checked out the NorCal Section located here? If not check in today! That's Awesome!! I know you had to move the seatbacks forward, did you remove the stiffening rib from the back of the cab? The stiffining rib was spotwelded every other rib. 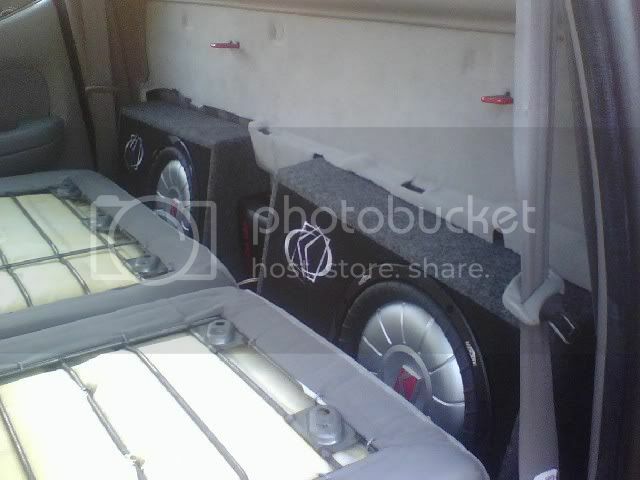 It sounds very nice, not as nice as my 2 12" on the backseat but, I'll live. The best thing, I have my back seats back. 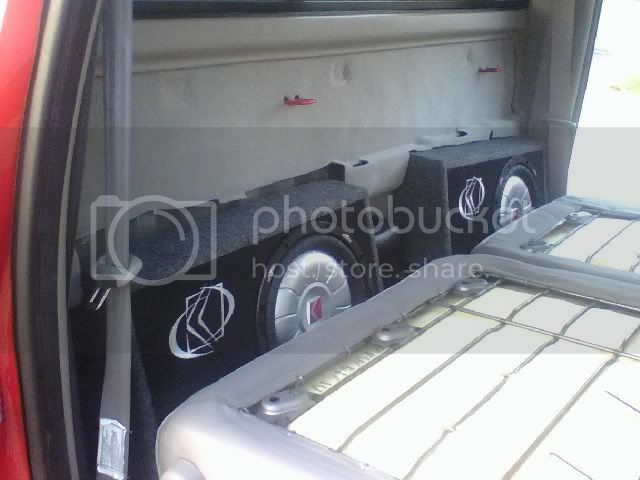 I can't tell from the pics, are those boxes sealed or ported? I've been looking pretty hard at the 12" CVTs to use in a single, sealed box. I'm even thinking of building a few d-cab boxes to sell to a local shop, but I'm not sure what sub to build them for. A single sealed 12 should pound pretty good on 400-500 watts though.. These trucks are a real challenge to get a good sub into, I think its really cool that you were able to use pre-fab sub boxes and keep the back seat useable. 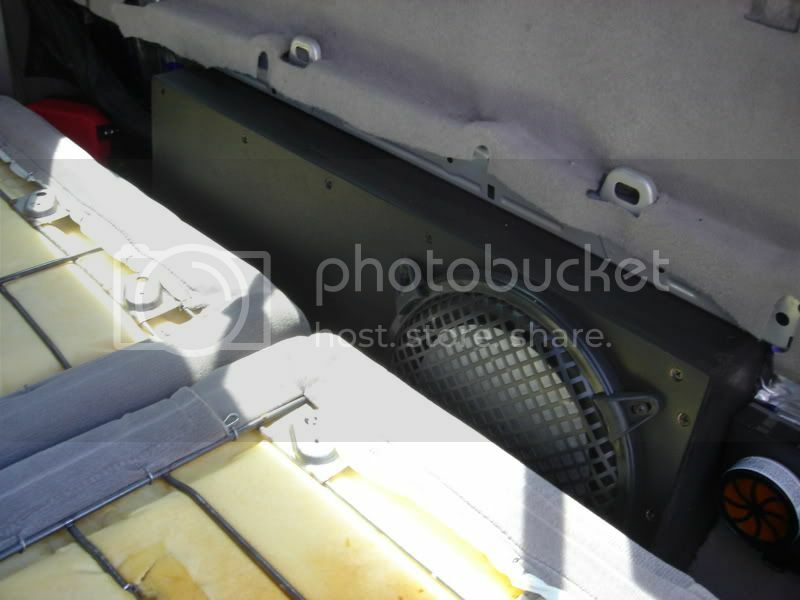 Are you having a problem with the excursion of the woofer causing the cone to hit the metal on your seat back? 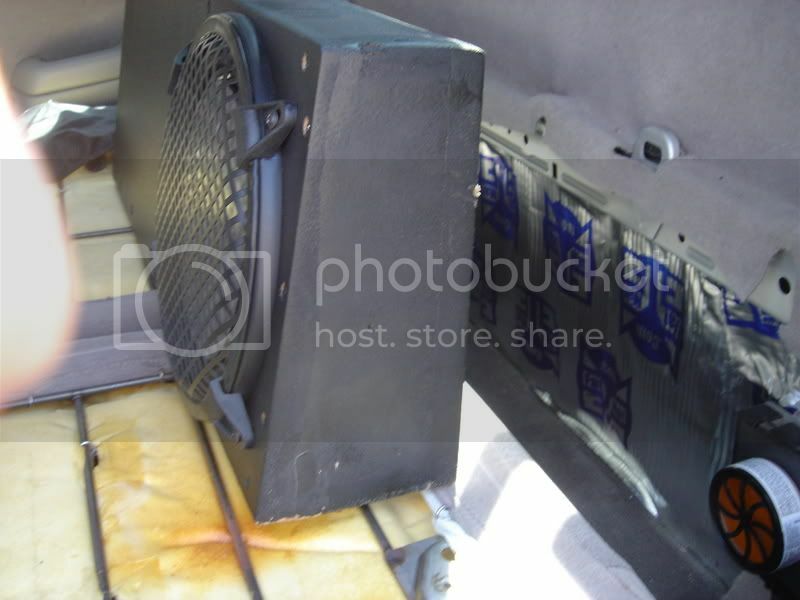 I noticed that to be a problem in my very first sub box I built for my double cab. When I built my second box, I had to use panels to protect the sub (and a grill). Another thing I noticed on my first box design was how the seat would completely stifle the sub when put back into position. Again, making the panels around the sub corrected that too. It is a TCVT10 4ohm sealed, Crutchfield has them for 240$ delivered. I used that for a test fit, after I deemed it would fit, I returned and added 30$ extra and bought 2 of them off of ebay. Total 270$ for 2 delivered with 1 yr warranty. I don't appear to be having a problem with the excursion. I viewed 1 sub at a time behind the seat and once you start to put the seat back you see the speaker gets more space. (hard to explain). I am getting some stiffling of the sound, thats why I put in 2 subs. That's good to hear. I may have had a harder time since I kept my box within the limits of the channel running across the back wall. I had to keep the box very short and mount the sub very low. The only major disadvantage I see on your modification to your truck is that you have removed part of the child safety restraint system for forward facing car seats. That wasn't an option for me since I have a 1 year old. I hope someone doesn't buy your truck down the line only to realize it is missing . Did you have to remove the lower LATCH system as well? The lower latch is gone and my kid is 7 so I don't need the child latch. I plan on keeping this truck for quite awhile. Heres my 10" Elemental Designs install. I also Still have my tools and towing computer with the way I made it, all 3/4inch mdf, and Sound proofed the back wall below the bar. Still gets a tad bit muddy sounding when I get the volume way up there due to the grill vibrating against the ribs on the seat. JL Stealth box, cant even see it in the truck. a little on the expensive side but its the best 4 sure. What are you talking about exactly? Unless JL is releasing a new stealthbox for the 01 - 04 Double Cabs (which I doubt since the truck is no longer made), this post makes no sense to me. Now, from what I have heard, JL is making one for the newer double cabs. Whether or not that would fit in the older double cabs is beyond my knowledge. The control box behind the left rear seat is the towing computer? How hard would it be to relocate? I'm thinking of making a few boxes to sell but my design would need that box moved to work. Mine only uses the space behind the left rear seat though, so the storage behind the big side of the rear seat is still open. Last edited by yamataco; 06-14-2007 at 02:53 PM. I love the sound, it doesnt hit as hard as alot of 10's but hits harder than an 8. The computer would be annoying to relocate but im sure it could be done easily, just needs the wiring extended ect. they need like .3 cuft of airspace so I bet you could easily fit 2 in there, Im running it off like 300 amps, I dont think it would be able to handle more. Doesn't sound like it at least. As the originator of this thread, I thought I would follow up at the 9 month mark with my current solution. I did a lot of research. I didn't want six inchers, no way no how. I didn't want shallow mounts either- they just can't take the pounding I wish to inflict upon my sound system. I ended up going with a Rockford Fosgate P2 10 inch sub in a sealed box that sits on the middle of the back seat. I can still seat two grown men on either side with room to buckle in. The box cost all of $50 at Circuit city, and is 11" x 12" x 15" and the sub fires upward. It sounds AWESOME! Hits real deep, and tight. I never would have went with sixers in the first place if I knew. Total cost was less than $200. Mind posting some pics of it? I'll see if I can't take a pic or two for ya. Twice now I have had adults in the back seat on either side of this box, and both said it was fine. My kids (a ten year old, and a three year old in a car seat) sit on either side all the time. Seems to be a decent sound solution for now. "04 Taco D-cab TRD, All-pro coilovers with Bilsteins, All-pro A-arms with uniballs, Bilstein 5100's in back, All-pro long-travel rear leafs, All-pro wraparound bumpers, sliders, and skid plates, CB, external trans cooler, winch, and an awesome sound system. i bought mine not too long ago. after getting tired of having a 12inch sub box just taking up a seat. fits right in the slot and i got the pioneer shallow sub that works really well. no complaints. [noun] A high performance street car with an inconspicuous, stock outward appearance. Im interested in building the exact same box you described but im just wondering if you still have any pictures so i can see how you built it so i can gather some ideas... please and thank you!